Sardar visits Chinese friend dying in hospital. 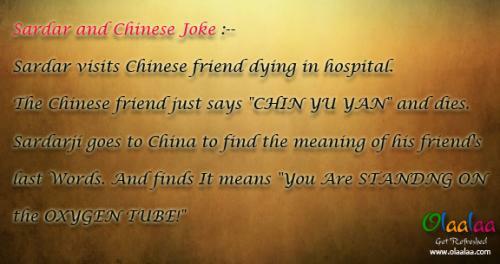 The Chinese friend just says "Chin Yu Yan" and dies. Sardar goes to China to find the meaning of his friend's last words. And finds it means "You are standing on the oxygen tube!" Sardar visits Chinese friend dying in hospital. The Chinese friend just says "Chin Yu Yan" and dies. Sardar goes to China to find the meaning of his friend's last words. And finds it means "You are standing on the oxygen tube!"